Brussels, often referred to as the ‘Art Nouveau Capital’, boasts over 500 Art Nouveau buildings. 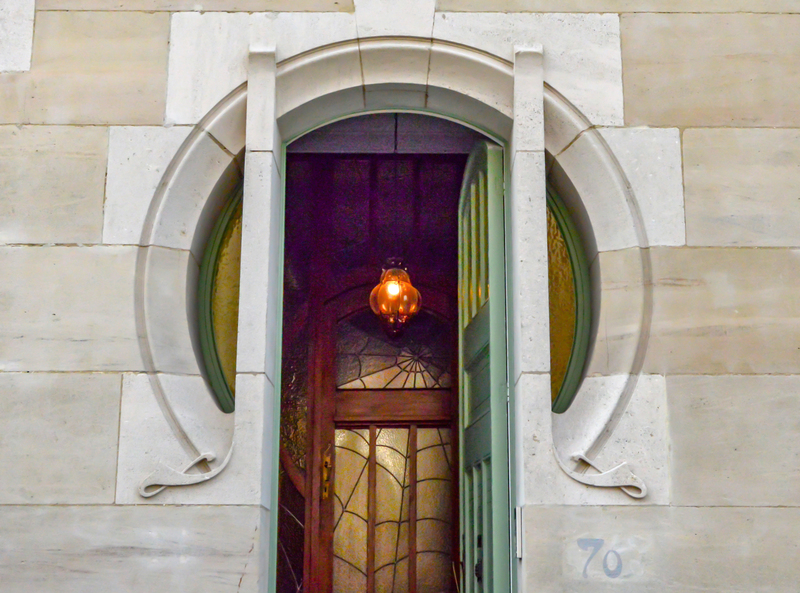 Each April the BANAD Festival gives members of the public a unique opportunity to visit Art Nouveau and Art Deco homes, schools, and even churches across Brussels, many of which are normally closed to the public. This year 40 buildings opened their doors. Throughout the whole festival stained glass windows, with light orange and yellow tones, skylights, and large, bay and horseshoe-shaped windows decorate buildings. 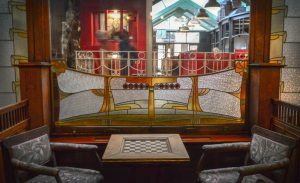 Geometrically styled designs, mosaics floors, the first electrical lighting, and a decidedly Japanese and Egyptian influences combine to make Art Nouveau and Art Deco so decidedly of its time. I had the opportunity to visit just a few of the buildings at the festival this year. 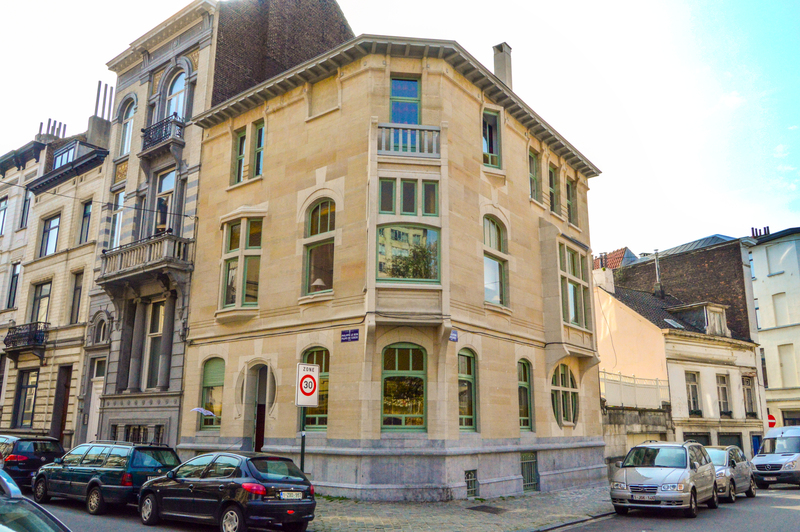 In 1900, numbers 24-34, rue André Van Hasselt, were built by the architect by Gaspard Devalck. Devalck House was built as Devalck’s personal home. The other houses were built as a portfolio to demonstrate the architect’s flexibility and each has its own unique style and flair. Numbers 24-34, rue André Van Hasselt, demonstrate an eclectic style. I had the privilege of being shown around the house by one of its owners. She is clearly extremely passionate about Art nouveau and restoring the house to as faithful a reconstruction as possible. Every piece of furniture and artwork is authentic. Left: Lower floor. Right: Upper floor. 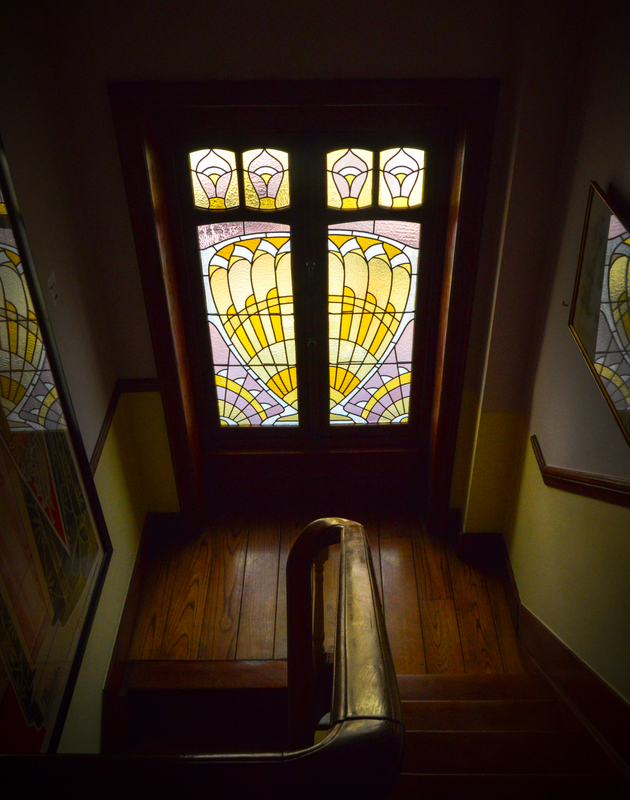 The most prominent and breathtaking feature of this house are the stained glass windows, probably by Raphaël Évaldre. Colored lilies decorated the doorways, starting closed and gradually opening up as they move towards the front of the house. Because the building is listed, there are many restrictions on renovation work. 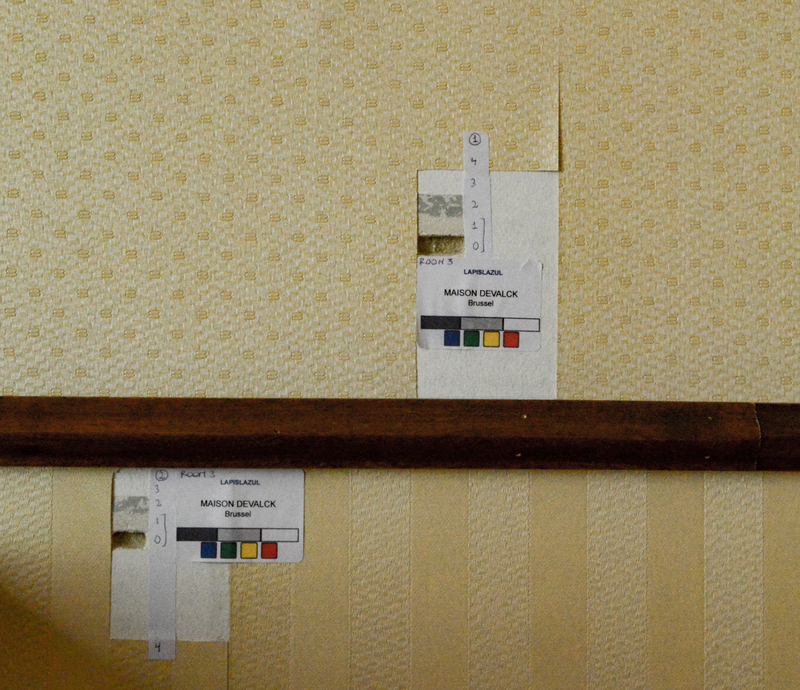 Small stickers decorate the walls where the paint has been painstakingly taken away layer by layer. It even shows some of the original, horsehair plaster. 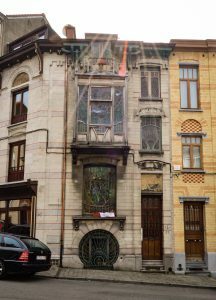 This house was remodeled by Paul Hamesse in 1904, responsible for many of the Art Nouveau buildings across Brussels. Stepping through the door is like entering a time machine. Visitors are greeted by a large a spacious entrance hall with a marble staircase and elegant stained glass doors. Many of the original pieces of furniture remain. The most dramatic part of the interior is the ceiling (see the cover image). Wooden paneling and stained glass divide the rooms, but the glass and large skylights, give a feeling of openness and space. Each piece of glass has a unique rippled texture, which scatters the light as it enters the building. Combined with the painted fabric used in place of wallpaper on the walls, the whole building has an extremely tactile quality. 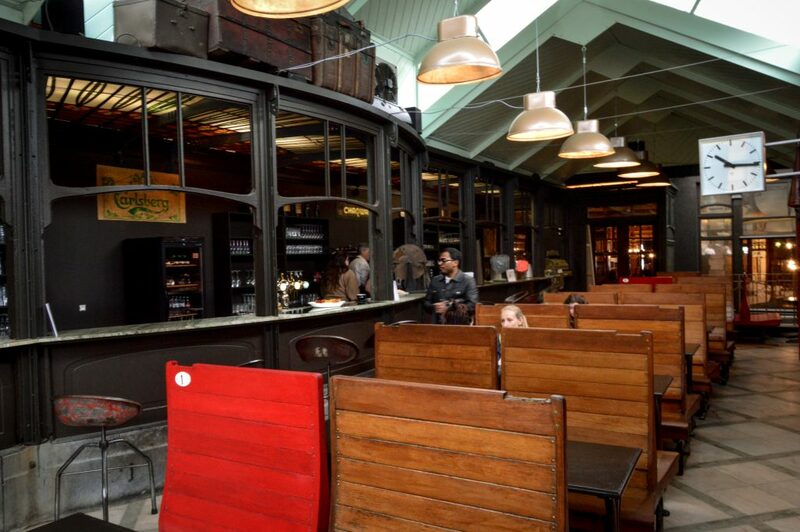 The area where the garden once stood has been converted into a charming cafe. The windows have been removed however, the stained glass ceiling remains and the waiters and waitresses serve through the windows. 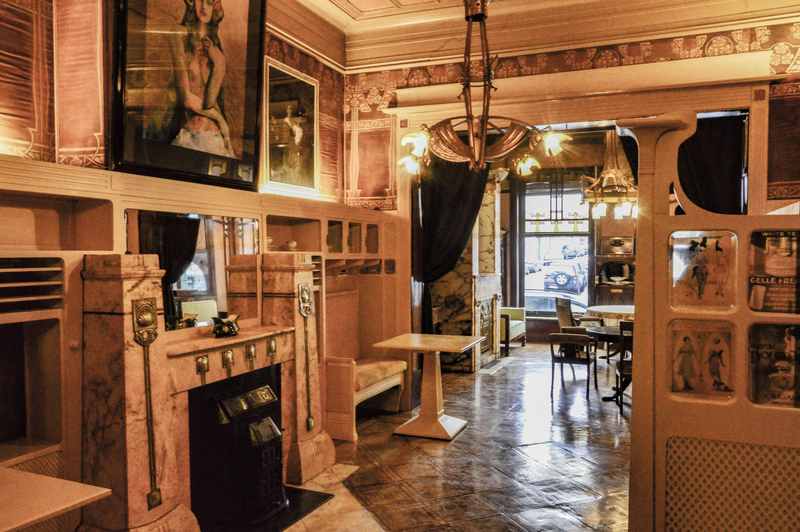 It is one of the most unusually styled cafes I have ever visited. Designed by Victor Taeleman, this house features a most unconventional, spiderweb, stained glass entrance door. 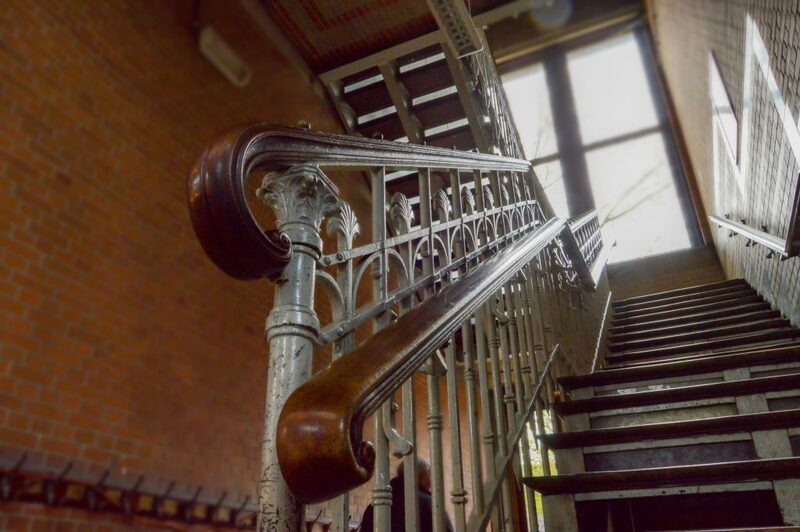 The staircase ascends 3 stories and has hearts cut into the wood every 4th baluster. 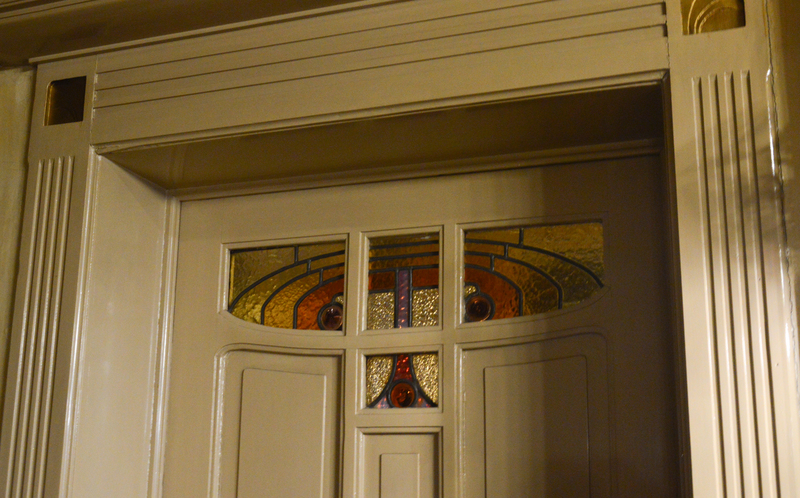 The cupboard under the stairs is decorated by upside down, stained glass hearts, hinting at the building’s shadier past. The ceiling of this building is particularly stunning with a minimalistic, slightly raised, geometric design, no doubt influenced by Mackintosh. 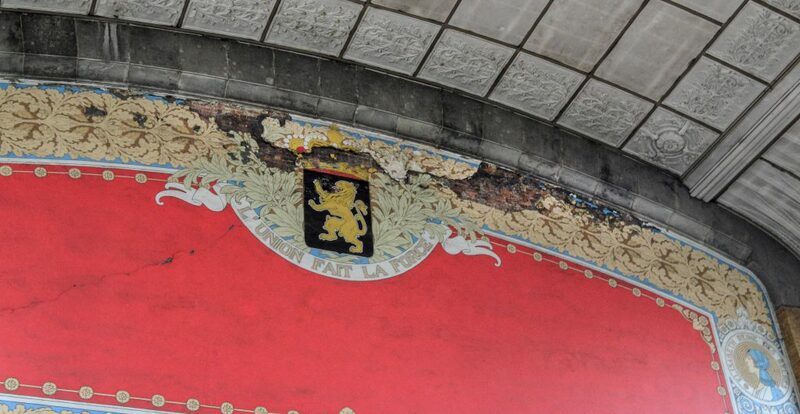 There is also a unique radiator design that has a cupboard cast above the water pipes, most probably for hats, scarves, and gloves in winter. Something I would love in my own home! As this is a private home, photography was not permitted, however, images of this extraordinary building are available here. Designed by the Architect Henry Jacobs, as 2 schools: 1 for boys and 1 for girls, with a kindergarten attached. It still functions as a working school and many of the classrooms have their original furniture. It’s certainly more beautiful than most schools! The handrails are set a two different height to accommodate children of different ages. Permission was granted for construction in 1907. The girls’ school was completed in 1913, however, due to WW1, building work ground to a halt. 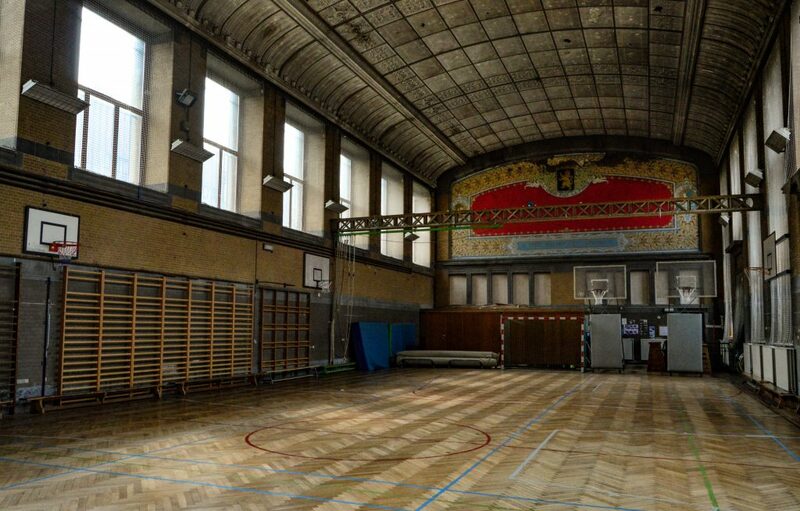 The boys’ school was eventually completed in 1922, which is why the sgraffito in the gym of the boy’s school depicts Albert I in military garb. 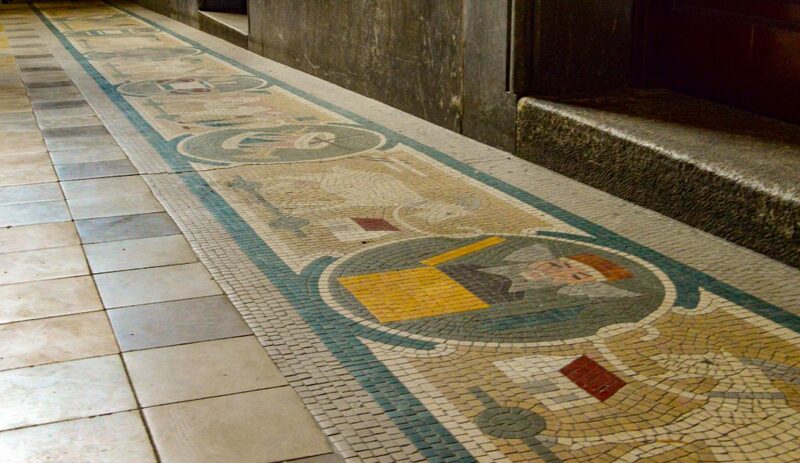 On the floor of the entrance to the kindergarten, there is a mosaic mural with imagery such as rocking horses and drums. Above, a sgraffito has a slightly abstracted landscape running along its length. The school makes fantastic use of natural light. All classrooms face either North-East or South-West, to balance the natural light source. In the main halls, there are large, geometric styled skylights running down the center. 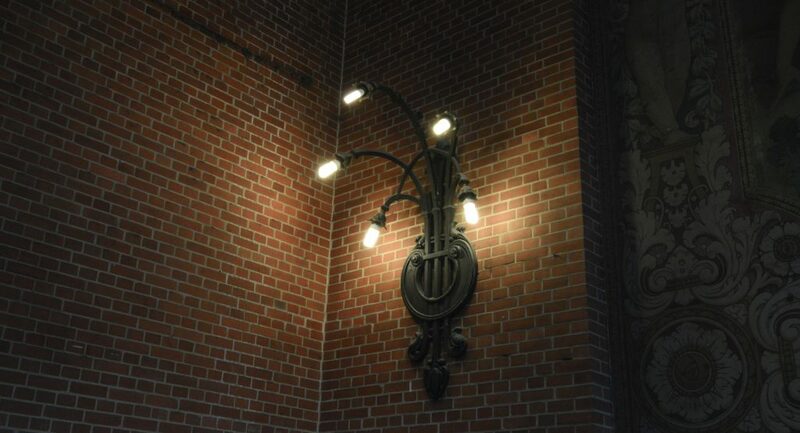 An example of some of the first electrical lighting. Designed by Jean Cimbaz. Prior to this, he had never designed a church. 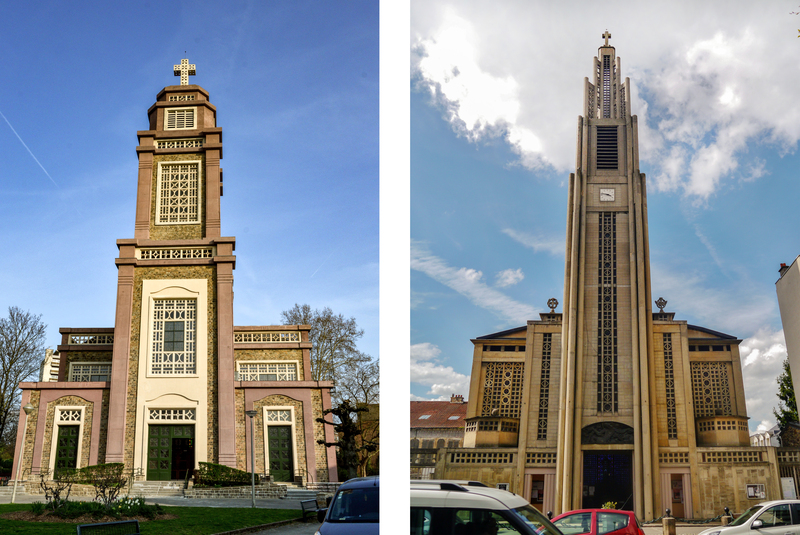 It was completed in 1928 and is the first concrete church to be built in Belgium. It was inspired by the Notre-Dame du Raincy, France. The unusual design met with criticism for many years, particularly the light and colorful nature of the interior. The church stands at 49 m (161 ft) high and features a rather unusual 4 ½ m (15 ft) high, geometric, concrete cross. Although Catholic, the church is square in shape. 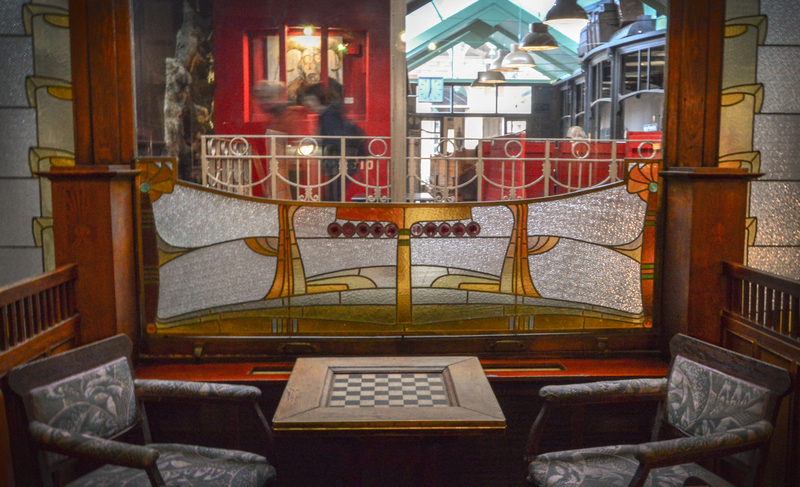 It features 6 large stained glass windows, 3 on each side. These were all replaced between 1950-56. 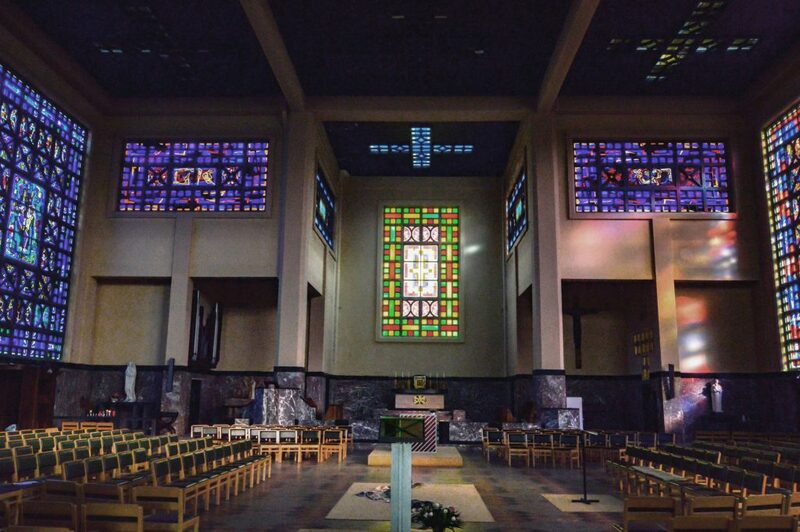 The glass in the altar and at the entrance remain from the original design and the roof has 9, stained glass crosses. 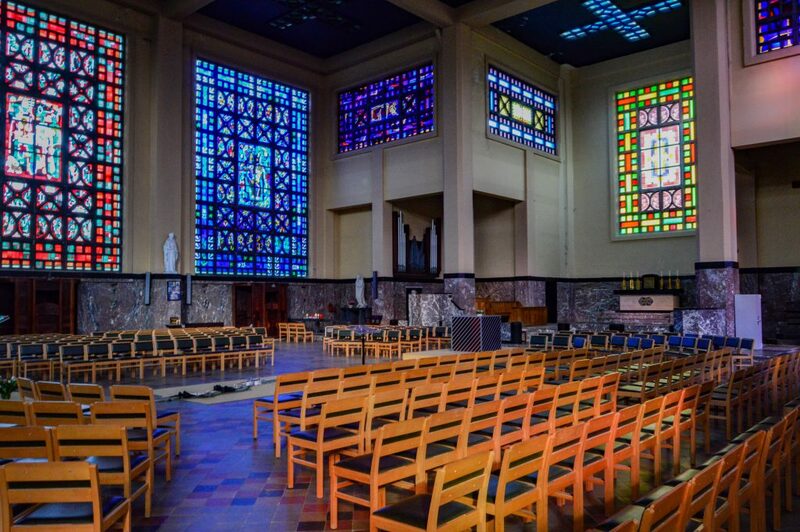 The pulpit, confession booths and alter all feature the typical, geometric, Art Deco feel and the floor is titled in the colors of the Belgian flag: black, yellow, and red. No safety breaks on this elevator. Would you use it? An interesting and somewhat unexpected aspect of the Festival were the elevators. 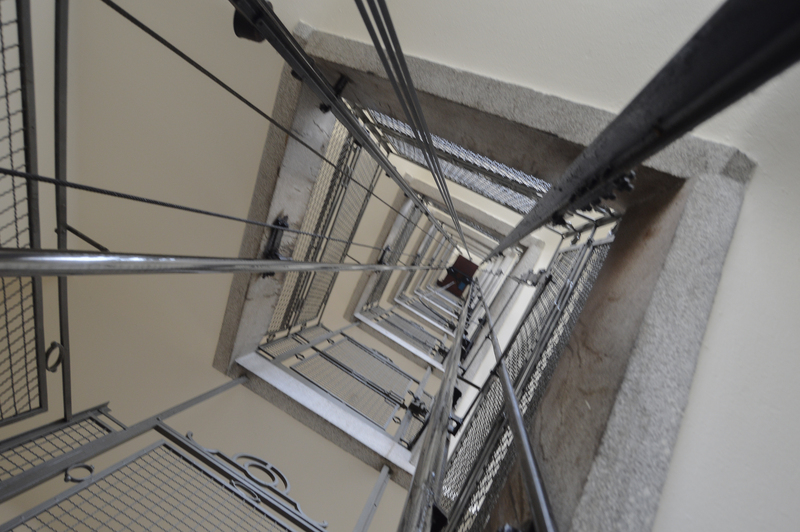 In a previous post, I talked about the invention of the safety elevator by Elisha Otis. 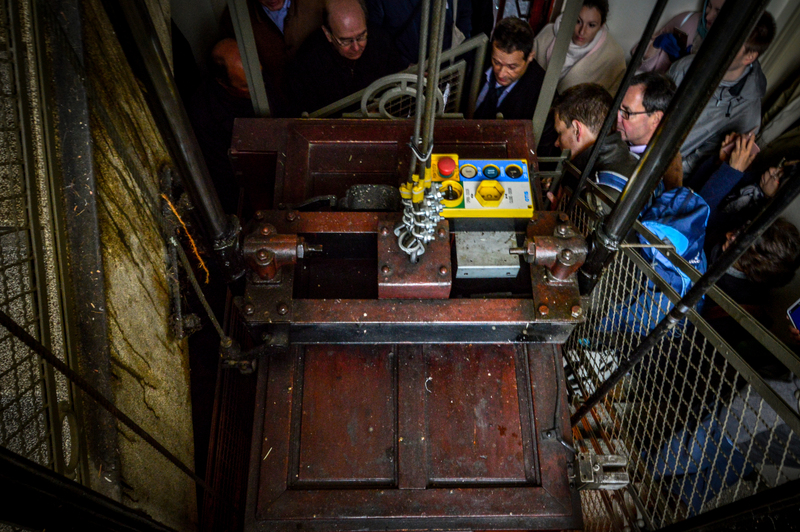 However, many of the elevators in buildings that were built at the turn of the last century do not adhere to modern legislation, condemning many vintage elevators across Brussels. This has caused a huge amount of outrage. Many consider the current repair methods too brutal and tantamount to destruction. When you see these elevators in person you can understand their concerns. A campaign called Save our Elevators was started that seeks to preserve the elevators. 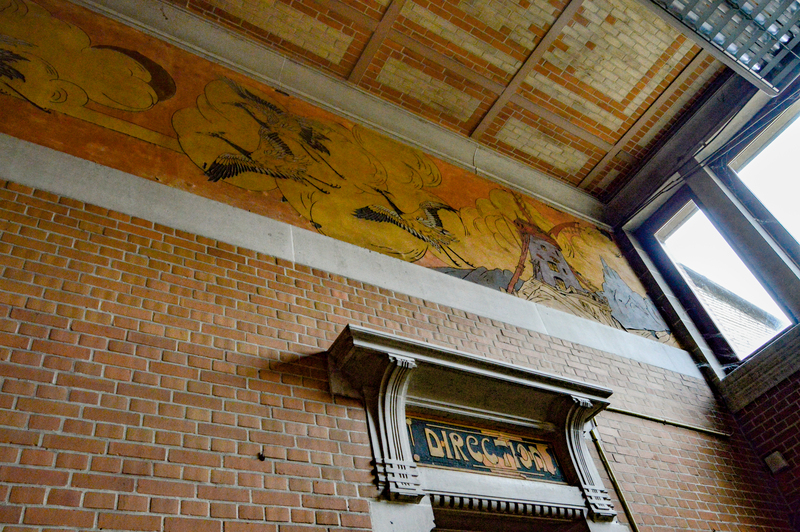 Sgraffitos decorate the interior and exterior of Art Nouveau buildings across Brussels. The somewhat experimental technique involved applying layers of plaster, adding a tint to the still damp surface, and scratching the surface to reveal the layers below. Unfortunately, these failed to stand the test of time and almost all have crumbled faded or simply been removed. Could this be an art lost to the sands of time? 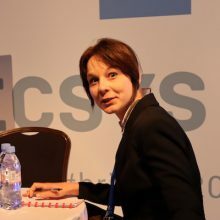 Why not test your design skills? 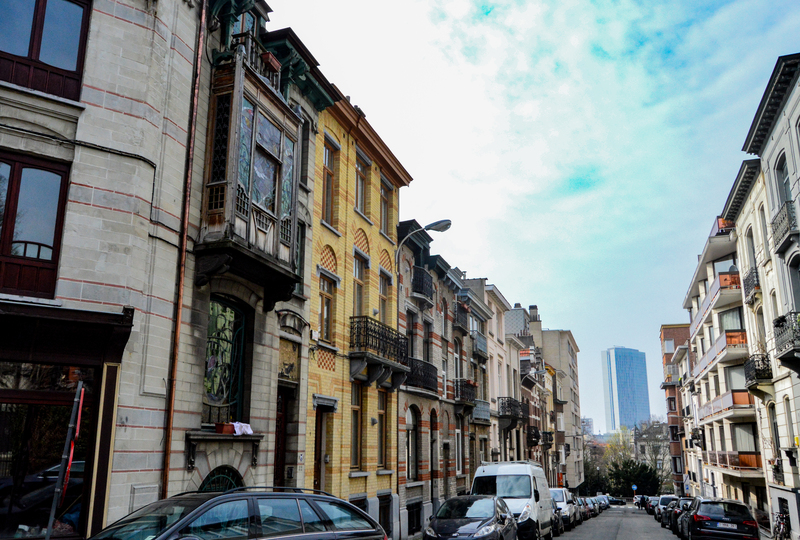 Brussels, the ‘Art Nouveau Capital’, boasts over 500 Art Nouveau buildings. Each April the BANAD Festival celebrates this. 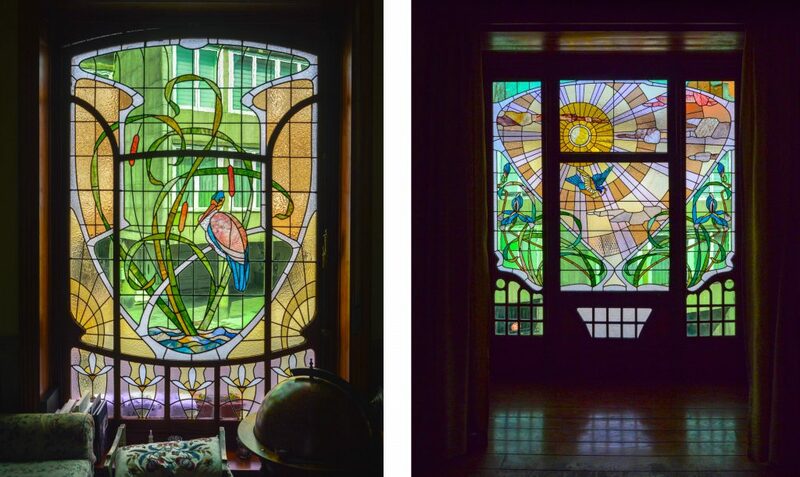 Art Nouveau buildings focus on the use of natural and artificial light, bright colors and Japanse influences. Stained glass windows and skylights are a common feature in these buildings. Sgraffitos were also common, however, they have mostly fallen into disrepair. 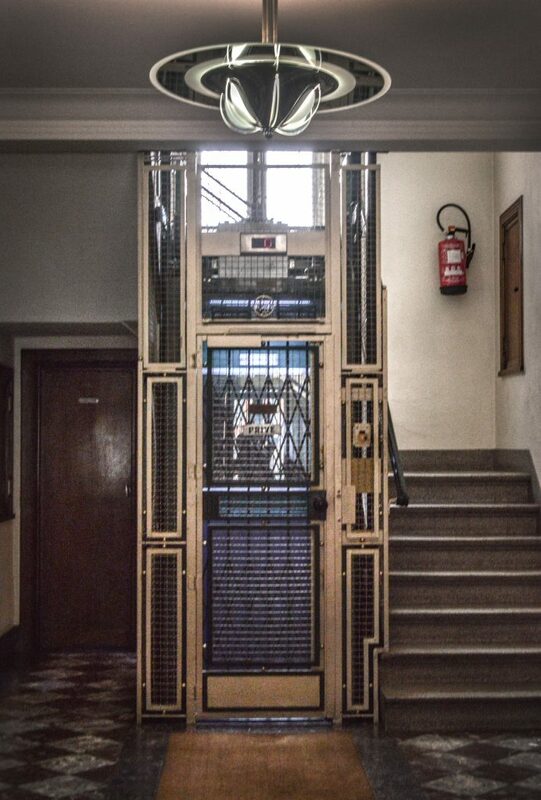 Many elevators from the era are considered dangerous and a group has started to conserve these historic monuments.